During my entire career I have watched teammates fall victim to poor hydration. They would say things like “Too much water will slow me down”. You know what slowed them down, was the heat illness and cramping. Lets be for real about this. 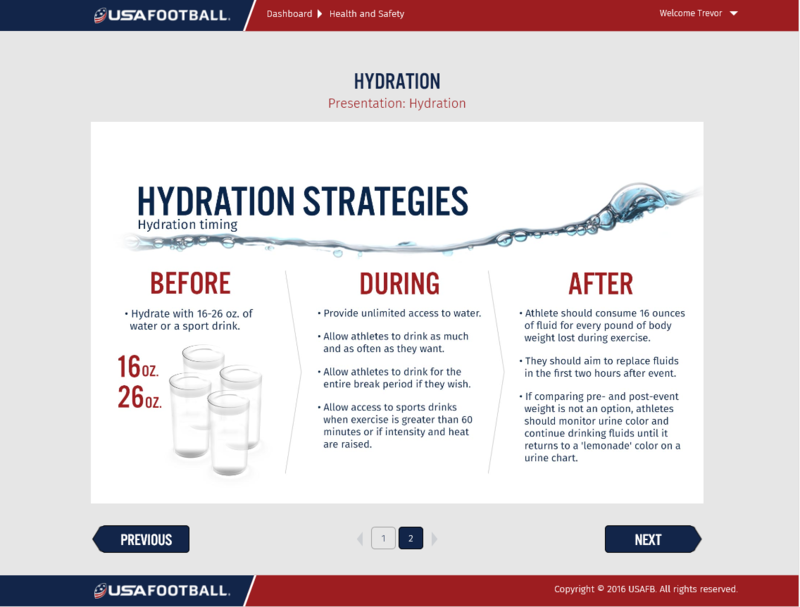 I have seen top tier athletes have to get IV fluid pumped into them because they were not properly prepared for practice and became dehydrated. You walk into the locker room and you see your friend looking like a marshmallow man all puffy and looking sad. As a coach of youth I take staying hydrated very seriously. I will always have that one kid, when it is mandatory time for water they will walk around like I told them to go drink the kool-ade or something. (I am from Guyana so I am allowed to use the reference.) I will calmly walk over to them and loudly inform them that the water break is not a suggestion it is a REQUIREMENT. 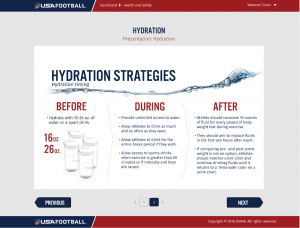 So for all of you parents out there who might think I don’t know what I am talking about even though I have given you this very cool back story here is a slide from my USA football training showing that it is important to have your child hydrate “BEFORE, DURING and AFTER” practices, games, walk through, or any other type of activity in the heat. Happy practicing and playing and one more note. Don’t stay thirsty stay hydrated my friend.